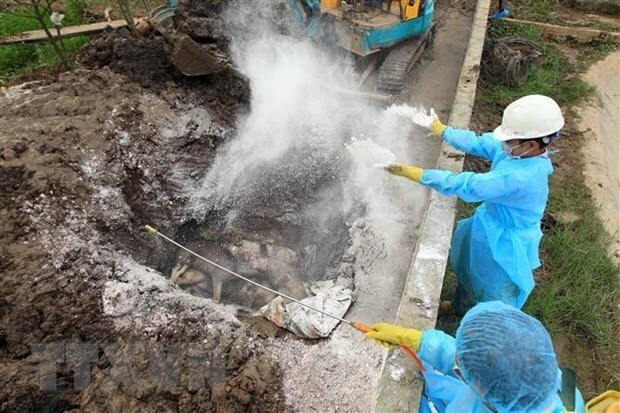 Hanoi (VNA) – Deputy Prime Minister Trinh Dinh Dung has signed a decision to form a national steering committee on the prevention and control of African Swine Fever (ASF), which is headed by the Minister of Agriculture and Rural Development. The committee is tasked with supporting the Government to direct and regulate the coordination among ministries, ministry-level agencies and relevant units in preventing and fighting ASF across the nation. It will help the Prime Minister to connect with ministries, Government and Party agencies, the Vietnam Fatherland Front and the community to mobilise resources for the implementation of urgent plans to prevent and combat the epidemic, while supervising the realisation of the plans. Members of the committee, including representatives from various ministries, media agencies, the Vietnam Fatherland Front Central Committee, and a number of organisations, will bear responsibilities for their tasks before the law and head of the committee. According to the Department of Animal Health, from February 1 to March 18, ASF was reported in 294 communes, 62 districts of 19 cities and provinces. As many as 34,774 infected pigs were culled.